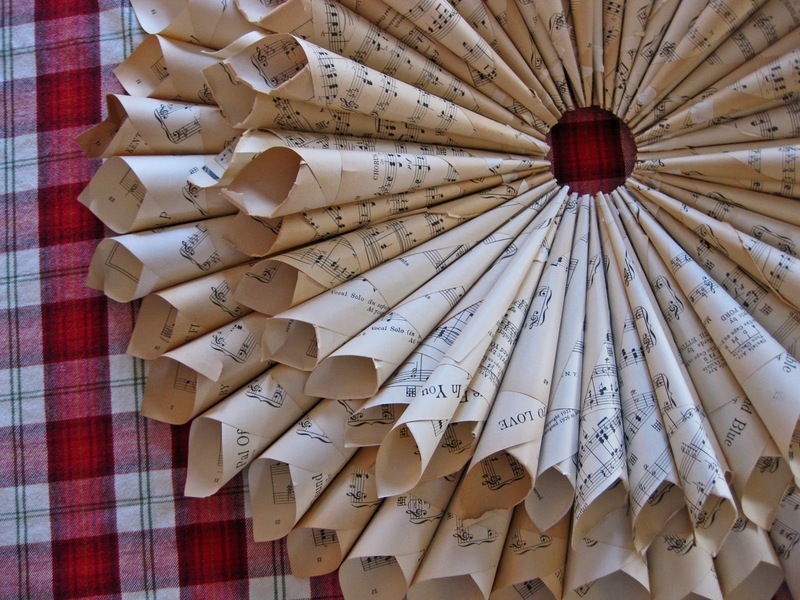 I made a music sheet wreath! oh! i’ve just been so excited to share these pictures, but haven’t been able to until my sister-in-law recieved her gift. my brother, sister-in-law and my nephews and neiece visited this past weekend for christmas. now i can finally share. so check out what i made…. ain’t she a beautiful!? i admittedly got the idea from miss mustard seed. i’m sure you’ve heard of her? if not check out here ah-mazingness here. miss mustard seed mentioned she would be be posting a tutorial and when i saw books of antique sheet music at this shop in state college pa, i knew this make a great gift. i’m still patiently waiting to see miss mustard seeds tutorial, but needed to find some others in the meantime. so i did a search and found a couple. i loosely used this tutorial and this tutorial with changes/techniques of my own. which, in the end, i’m glad i did because i like the way mine turned out a bit better (not to toot my own horn [well, maybe a little]). and while i don’t have pictures of the process (i made this late at night) i can try to explain. for the form, i just used a piece of really sturdy cardboard i cut in a doughnut shape. thankfully i had to do a lot of online christmas shopping and had plenty of boxes to choose from. all the music sheet cones were wrapped individually. for the outer most cones i used a full sheet. for the inner cones i cut the sheets in half. once i got the hang of making all the cones the process went pretty smooth. it did take me multiple attempts to figure how to wrap them to look exactly the way i wanted. this is a pretty good explanation. i ended up just doing it on a flat surface. the whole twirling in mid-air this was not working. and keep in mind, the older the music the harder it is to roll as it tend to tear. 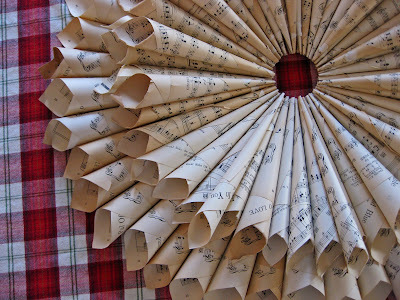 i set a glass in the middle of the cardboard wreath form as suggested to maintain a perfectly round shape in the middle. i laid everything out first to ensure i had enough cones. then i hot glued it all together. 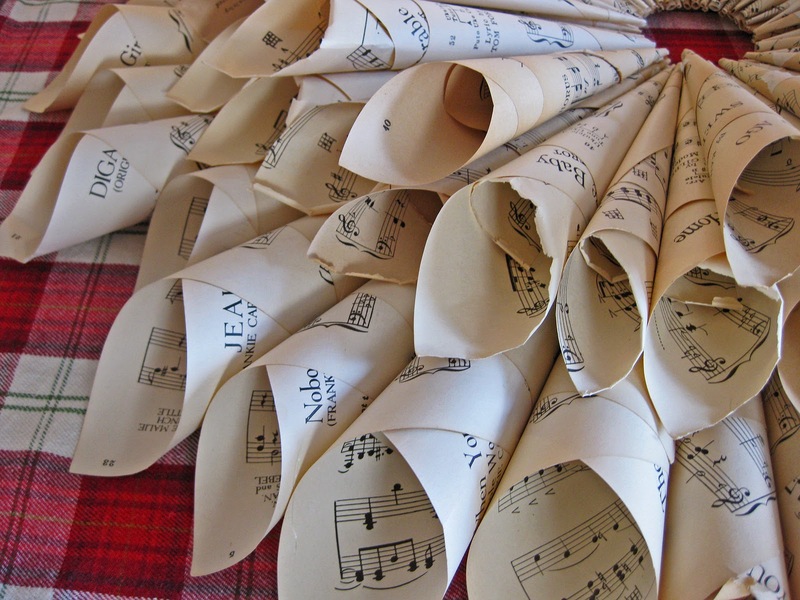 if i can get my hands on more sheet music, i’ll defiantly be making more! love it! pretty and simple! Very original. Thanks for idea. Toot away! Oh, your wreath is gorgeous! Looks like you did an awesome job. 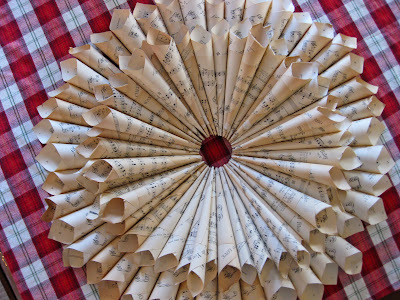 I’ve just made a wreath too and now I want to make one like yours! You’re very creative! Your wreath looks so perfect, Michael. I love the neat double layers and the yellowing of the pages. 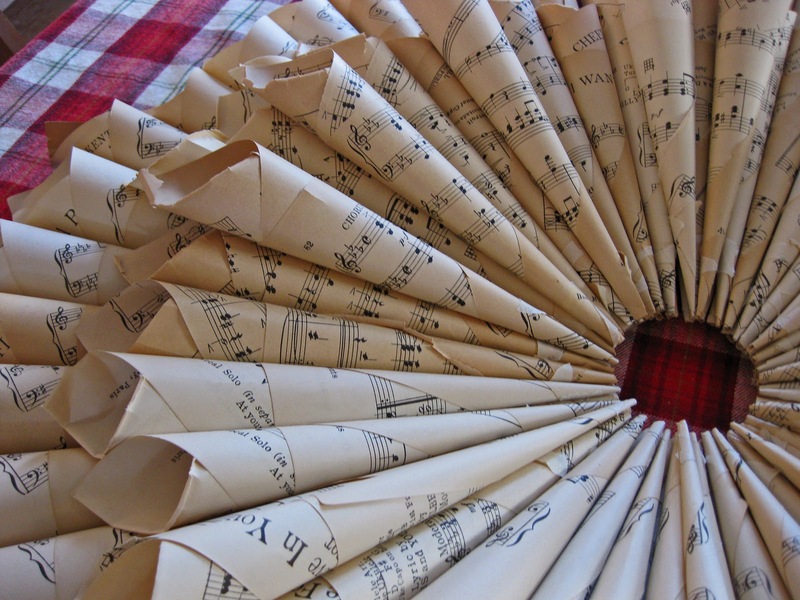 When I made my wreath, I just copied sheet music on my copier. 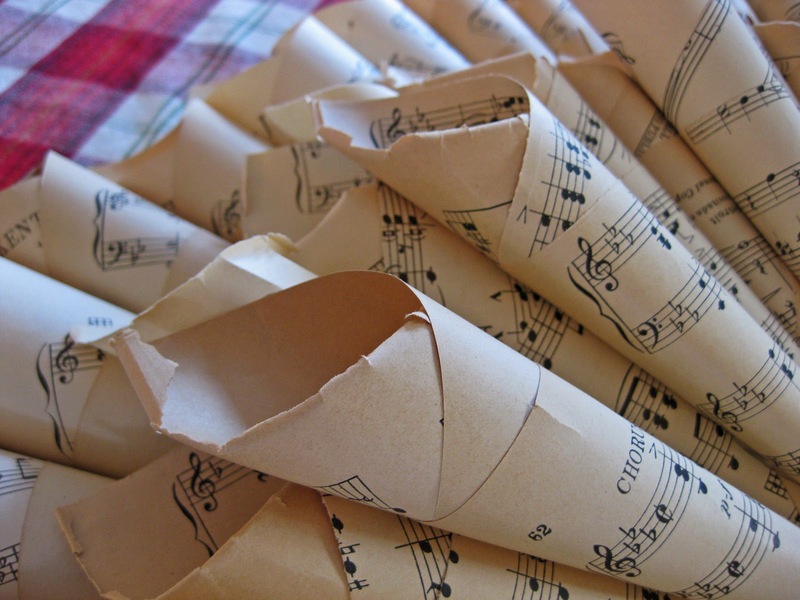 You never have to use the real sheet music. Great job! The wreath is so unique. My husband loves music and guitars. I will probably try using pics of guitars and sheet music. Thanks. love it. i’m a music teacher.going to make one for school!